Do You Seek Wealth, Fortune and Happiness? Then Open The Flood Gates and Let The Money Rush Toward You! 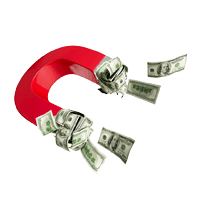 Would you like to attract money to you as if you were a money magnet? Would you like to have the Midas touch and have money and profitable opportunities come your way? Do you feel that it’s your destiny to be rich and to enjoy a leisurely life of luxury and prosperity? You are certain that once you experience this financial windfall, you will know exactly what to do with all your newfound extra cash. You feel it’s time for you to enjoy all the luxuries and riches that the world has to offer. And once your financial situation is secure, you will be able to rest easy knowing you have all the money and wealth you’ve ever wanted and that you’ll ever need. If the above words accurately reflect you and your current state of mind, ask Jean Claude Swann to cast this powerful Money Magnet spell in your behalf.